I won’t lie – I’m actually pretty annoyed by how easy this recipe is. It also is pretty much a billion calories less than anything that a pizza joint could give me. This is for a personal pan-sized pizza. Double it if you want it for a larger size. I put the ingredients into the bowl – in that order, but mixing up the dry ingredients up before pouring in the water and oil. Let this sit for about an hour. At this point, I pre-heat my oven for 250 degrees. On whatever surface I’m letting my pizza bake, I use about a half teaspoon (no more than a whole teaspoon, though) of extra virgin olive oil, and smear it all over the pan/aluminum foil. Just to make sure my pizza doesn’t stick. I then sit the pan inside of the oven, so that the heat can help the oil spread more. I then spread a little big of the extra flour on the counter area where I’ll be kneading the dough, making sure the surface is covered pretty well. 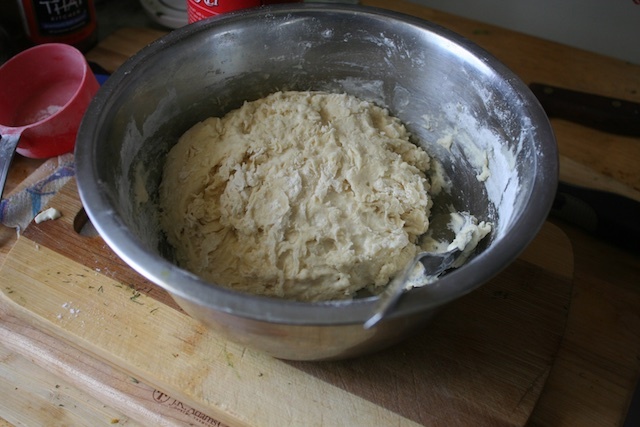 Some parts of the dough might be sticky, and the flour just helps to prevent that. I dump the dough out on top of all that, and basically knead it around the same way you see on TV. I use my hands, though. I’m old school. Grab your sauce, your toppings, and voilà! Throw it in the oven, give it about a half an hour or so. I’m impatient, I check on mine like every ten minutes like I’ve never had pizza or cooked before. How crunchy or soft the crust is depends upon you. You’ll have to play with your options. 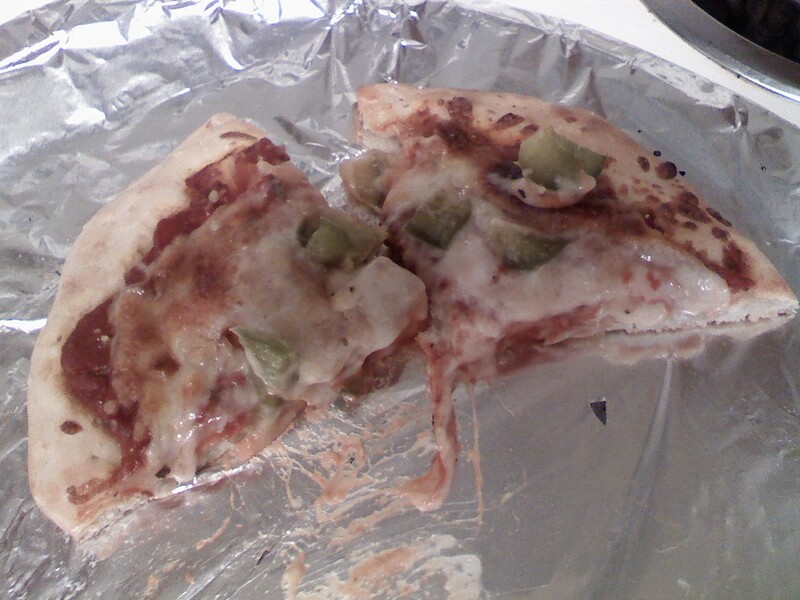 That’s my two slices of green pepper and onion pizza that my daughter left me—from 2010!—because she definitely debo’d me for the first half. I couldn’t even get a picture of the pizza before she stuck me for my slices. Hopefully, you won’t have a greedy toddler robbing your for yours. Best of luck, and bon appetit! Seriously?! That’s it?! I’ll be trying this next week. This makes a quick and easy meal for when I’m in the mood for pizza. I won’t be buying Trader Joe’s dough anymore! On that note, I made my own pasta today for the first time (covered it with my own sauce too!) Came out a bit thick and could have used some salt but you couldn’t tell me nothin!! I was so proud to have eaten something that I pretty much made(‘cept for the parm/romano cheese sprinkling on top). Thanks for all your encouragement. I LOVE your site! Thank you for all of the information and inspiration!Congratulations on your journey! This has changed my life…lol! Thank you!!! My husband and I are eating this pizza as I type….THANK YOU SO MUCH…it is absolutely delicious…never buying pizza dough again…lol! 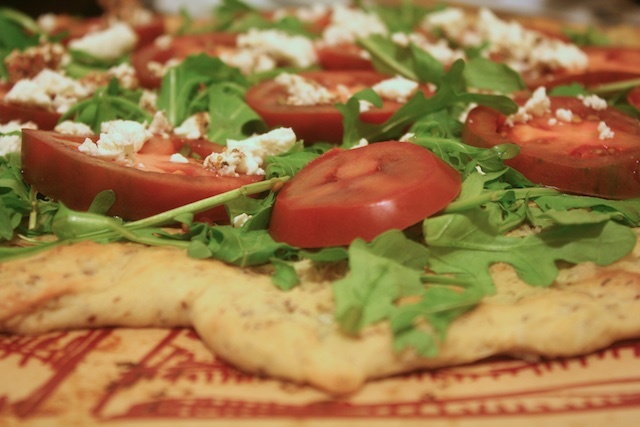 What do you think about using a piece of flatbread/pita bread as the base instead? Great way to make a quick and easy pizza. Kind of a thick and chewy dough, though. LOL Totally worth a shot. I think you’ll like it. Erika this dough was amazing! I used it to make barbecue chicken pizza. Now I will turn my up nose at store-bought pizza (like I do almost every processed food) because I know I can cook a tastier, healthier version. Thanks! This pizza dough recipe was so good. I made it on Sunday, my four daughters ate it all (3x the recipe to make 2 medium sized pizzas). The veggie and cheese was almost gone in a matter of minutes, they even ate the crust, and they never eat the crust. I had to hide some away for lunch the next day. Its now Friday, and they begged me to make it again, which I am! Thanks!